91 Commercial Real Estate & Properties in Woolloongabba are listed in 7 categories. We have 37 OfficesSale & Lease , 20 Retail ShopsSale & Lease , 16 Medical and Consulting PropertiesSale & Lease , 11 Industrial Warehouses Sale & Lease , 5 ShowroomsSale & Lease and 1 Other Commercial PropertiesSale & Lease . 298sqm warehouse in highly sought after Woolloongabba Self contained amenities Roller door access Two (2) car spaces plus additional parking in front of your roller door Parts rooms at rear Located just 2.5km from Brisbane's CBD and walking distance to the train station Lease Price: $36,000p.a. + Outgoings (approx. $10,000p.a.) + GST ( approx.) For further information or to arrange an inspection please contact the marketing agents Jack Gwyn or Jared Doyle of Ray White Commercial TradeCoast! Approx. 147m2 with almost brand new restaurant Catered for Japanese cuisine, excellent fit out Equipment includes canopy, grills, sushi displays, fridges, freezer, cold room etc. Restaurant sits approx. 70 people Great street frontage, right on Stanely Street (before on ramp) Parking available in the carpark or great street parking Affordable rent, minutes from Mater Hospital Contact Marketing Agent to arrange a inspection today! Located 2 kilometres south east of Brisbane CBD. It is crossed by several major roads including the Pacific Motorway for ease of access. $150sqm Gross Lease Warehouse In Woolloongabba | 298sqm $150sqm warehouse in the ..
A rare opportunity to lease a warehouse in a popular and central location! Minutes to everything and includes onsite parking: 298sqm space Good height Full building height roller door 4 car spaces onsite Expansive internal open plan area Office and toilets at back Concreted lunch area at rear Easy access to main transport hubs and arterials Walking distance to local amenities 250m to Park Road train station Please call Your Commercial to arrange an inspection. Features: 165m2 of quality first floor office space Boardroom, open plan area and multiple partitioned office spaces Fit out in place with furniture Telstra Fibre installed 3 exclusive car parks Kitchenette Male and female amenities Air conditioning throughout tenancy Location: 50 Logan Road, Woolloongabba is superbly situated just 2km from the Brisbane CBD. The property enjoys excellent public transport access as well as access to the Clem 7 Tunnel, Pacific Motorway and Lytton Road. Neighbouring amenity includes numerous cafes, bars and retail outlets. For further information, or to book an inspection, please contact the marketing agents at Ray White Commercial (QLD). approximately. Woolloongabba Retail Opportunity Awaits $49,788 per annum Gross +..
Home to a long standing retail operator, is this 174 m2 shop on busy Stanley Street. The tenancy offers outstanding exposure to the thousands of cars which pass by daily. Features: 174 m2 retail shop. Large Storage area. Separate kitchen and office combination. Internal bathroom and shower facilities. Close access to the City and South East Freeway. Busway just minutes away. Close to cafes, shops and restaurants. For more information or to book an inspection contact Tom Chan of Blocksidge Real Estate on 0478 586 131. Character commercial office space Mixture of open plan and partitioned areas Air conditioning throughout 8 Car park spaces located at the rear Three phase power Kitchenette and amenities Huge exposure with signage opportunities 29 Balaclava Street, Woolloongabba is superbly located approximately 3 kilometres from Brisbane CBD and is found within the heart of the suburb's commercial district. Approx. 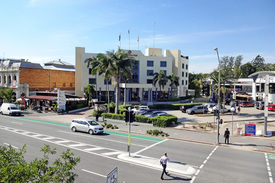 288m2 Front office / showrooms + mezzanine office throughout Brilliantly positioned in central Woolloongabba Short travel & convenience to Food & Service Solid concrete block construction Roller door access for despatch & loading 3 allocated car parks onsite Minutes to Motorway Inspect today with Exclusive Agent! Located 2 kilometres south east of Brisbane CBD. It is crossed by several major roads including the Pacific Motorway for ease of access. Well presented first floor office, located across from the Woolloongabba Busway station, and within close access to the South East Freeway and main arterial roads. Other Features: 3 fully partitioned offices plus open reception/waiting area Split system air conditioning Plenty of natural light Kitchenette Male & Female amenities on site Close to shops, cafes and restaurants For more information or to book an inspection please contact your Blocksidge Agents. Newly refurbished executive office suites located on Ipswich Road nearby to the Woolloongabba Busway, the Gabba, Story Bridge access and retail precincts. 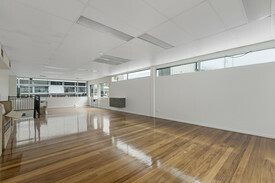 180m2 A grade Office Space split between four offices Top quality fixtures and finishing's Completely fitted communal kitchen Already furnished communal lunch room Male, female disabled toilets Good on site street car parking For more information or to arrange an inspection please contact Richardson Wrench Commercial Brisbane North. This 72m2 character office space is situated on the first level of a stylish heritage building. Located in the centre of Woolloongabba's commercial and retail hub, the property is surrounded by cafes, bars, restaurants and small boutiques. It is easily accessible and in close proximity to major arterial roads and the South East Freeway. Features of the property; Open Plan Layout. High ceilings with plenty of natural light. Two entries. Data connections. Shared bathroom and kitchen facilities. Break out areas. Close to Public Transport systems including Busway. For more information or to book an inspection please contact James Ovenden of Blocksidge Real Estate on 0404 191 537. This 35m2 open plan office space is ideally suited to a small operation. Its located right in the centre of Woolloongabba's commercial and retail hub, surrounded by heritage buildings, cafes, bars, restaurants and small boutiques. It is easily accessible and in close proximity to major arterial roads and the South East Freeway. Features of the property; Character Building. Located on the 1st Level. High ceilings with plenty of natural light. Two entries. Data connections. Shared bathroom and kitchen facilities. Close to Public Transport systems including Busway. For more information or to book an inspection please contact James Ovenden of Blocksidge Real Estate on 0404 191 537. Lioncorp is pleased to present this rare retail/showroom/warehouse opportunity situated 3 km from Brisbane CBD. Features include Spacious warehouse of 281m2 Loading bay to the front Huge signage opportunities & exposure High ceiling & exposed beams Newly insulated roof Skylights and 3 phase power throughout Previous cafe/coffee roasting fitout in place but can be removed if required Mezzanine to the rear Located 2 kilometres south east of Brisbane CBD. Woolloongabba is crossed by several major roads including the Pacific Motorway for ease of access. Features: Corporate office space Mixture of open plan partitioned areas Boardroom Kitchen amenities Roller door access Excellent natural lighting Ample car parking with additional spaces available for lease Huge signage potential Unit 2B is also available for lease and offers 143m² of office and warehouse space Location: 50 Logan Road, Woolloongabba is superbly situated approximately 2 kilometres from the Brisbane CBD. The property enjoys excellent public transport access in addition to access to the Clem 7 Tunnel, Pacific Motorway and Lytton Road. Neighbouring amenity includes numerous cafes, bars and retail outlets. For further information, or to book an inspection, please contact the marketing agents at Ray White Commercial (Queensland). approximately. Features: Functional warehouse/office space Reception area Kitchen and amenities Roller door access Excellent natural lighting Ample car parking with additional spaces available for lease Huge signage potential Unit 1B is also available for lease and offers 148m² of office and warehouse space Location: 50 Logan Road, Woolloongabba is superbly situated just 2km from the Brisbane CBD. The property enjoys excellent public transport access as well as access to the Clem 7 Tunnel, Pacific Motorway and Lytton Road. Neighbouring amenity includes numerous cafes, bars and retail outlets. For further information, or to book an inspection, please contact the marketing agents at Ray White Commercial (QLD). approximately. Situated in the busy Princess Plaza Retail Centre this top floor tenancy has unbeatable exposure in being directly opposite the Mater Hospital precinct. Currently an open plan tenancy, the owner will partition the tenancy for the incoming tenant. 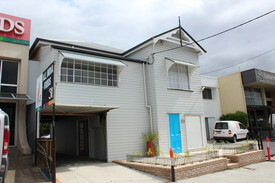 The property features: 58m2 open plan office/retail/medical usage. Signage opportunities. Approx. 100 customer ground parking lots. Great tenancy mix including a long standing law office, dentist and an array of food and retail operators. Owner can provide staff car parking at an agreed extra rate. For more information or to book an inspection please contact your Blocksidge Agents. 135sqm office/ showroom 51sqm ground floor showroom/ reception/ office 84sqm first floor office Male female toilets + kitchenette Two (2) exclusive use car spaces Fantastic city fringe location Lease Price: $33,750 p/a + GST Gross ( approx.) For further information or to arrange an inspection an inspection please contact the marketing agents Jack Gwyn or Jared Doyle of Ray White Commercial TradeCoast. Rent Reduction!!! Prime Office/retail Showroom Opportunity With Exposure $85,000 per annum Gross p.. Put your own mark on this open plan tenancy. Take either 140m2 , 200m2 or the whole 340m2 . ( approx.) Would suit Professional Offices, Gym, Allied Health or Large Retail Showroom. Features include: Recently refurbished interior Great natural light. Disabled Ramp Access. End of Trip Facilities. PWD Compliant Bathroom. Huge signage opportunities. Customer Carparking. Good off street parking. In close proximity to the CBD. Great access to major arterial roads and the South East Freeway . Bus stop at the door, approx. 270m to the Buranda Train Station and walking distance to the Busway. For more information or to book an inspection please contact your Blocksidge Agents. Available for Lease NOW Ground floor tenancy with existing Bakery fit out approx 102m2 Huge amount of car parking for customers over basement and ground levels Good tenant mix, directly opposite Mater Hospital Suited to variety of retail uses Fantastic signage opportunities Please call LIONCORP COMMERCIAL to organise an inspection today! Annerley is a suburb of the City of Brisbane, Queensland, Australia. Annerley is located 4 kilometres south of the Brisbane CBD. Located in the hugely popular Princess Plaza in Woolloongabba, this tenancy has the benefit of being located within the Mater Hospital precinct. 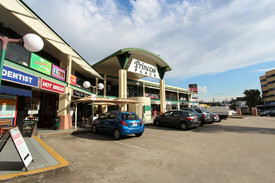 Highlights include: Approx 100m2 of prime retail space & PRICED TO LEASE Surrounded by high performing businesses including IGA and Cellarbrations Liquor Store An abundance of customer parking Grease trap Would suit many businesses For more information or to book an inspection please contact your Blocksidge Agents. Bakery/retail Shop For Lease $66,300 Net + Outgoings p.. Situated in the busy Princess Plaza Retail Centre this tenancy has unbeatable exposure in being directly opposite the Mater Hospital precinct. Home to a longstanding Bakery, it would suit similar offerings. The property has extreme potential for a Food or Retail operator. The property features: 102m2 shop Existing Bakery equipment including baking ovens and cold room Front counter and servery Approx 100 Ground parking lots Grease trap Generous rental rates Trading hours can be extended to evenings For more information or to book an inspection please contact your Blocksidge Agents. Amazing Cafe Opportunity Opposite Mater Hospital $6,200 Gross per month + .. It is just what the doctor ordered 124.7m2, located opposite the Mater Hospital. MAKE AN RENTAL OFFER plus EXCELLENT INCENTIVES...... The Hotel Diana is transforming a major part of their ground floor into a medical suite. We are seeking a Bulk Billing GP. This tenancy comprises an area of 124.7m2 and is one of two medical tenancies. We want you to make an rental offer. The site offers easy access for both clients and staff by way of public transport options. The site, shared by the Princess Plaza, has an abundance of convenient car parks, a total of 130 customer parks and 120 permanent parks. Perfect for a GP clinic. Other features include: Fully petitioned offices/consult rooms. Plenty of natural light. Unrivalled signage opportunities Main road access Great incentives for the right tenant For more information or to book an inspection please contact your Blocksidge Agents. Affordable Retail/office Space $23,400 p.a. Gross excl. .. Located on busy Stanley Street this prime retail/Office space enjoys maximum street exposure, and is close to both the Mater Hospital and Gabba Central apartments. Other features include: 55m2 of retail space Open plan tenancy Located within a busy commercial strip Affordable rates Air conditioning Kitchenette Male & Female amenities at rear of property For more information or to book an inspection please contact your Blocksidge Agents. We have secured a specialist medical tenant for 12 Annerley Road! The new medical is now located within the Mater and Lady Cilento Hospitals. If you are looking to position your business for success, enquire now! Available ground floor tenancies: Tenancy 1: 130m2 Tenancy 2: 97m2 Tenancy 3: 176m2 Option for a larger requirement Property features include: Unrivaled signage opportunities Competitive rental rates Availability to expand Main road access Car Parking Competitive cost The property is located within the Mater Precinct with the following nearby features: Bus Stop 100m Mater Hospital 100m Lady Cilento Children's Hospital 650m Ferry Terminal 750m Southbank Train Station 900m South Bank 1.4km Located 3 km southeast of the Brisbane CBD To learn more about this opportunity and inspect please contact Jose Rojas or Gavin Moore from McGees Property approx.